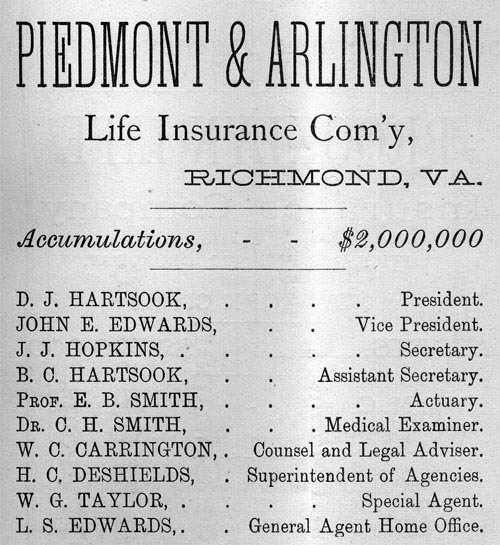 Piedmont & Arlington Life Insurance Comp'y, Richmond, VA.
JOHN E. EDWARDS,..... Vice President. B. C. HARTSOOK,..... Assistant Secretary. Dr. C. H. SMITH,......... Medical Examiner. W. C. CARRINGTON,..... Counsel and Legal Adviser. H. C. DESHIELDS,..... Superintendent of Agencies. W. G. TAYLOR... Special Agent. L. S. EDWARDS,..... General Agent Home Office. 1. The Insurance Advocate, Vol. IX, No. 3, Richmond, VA., March, 1878, page 53.